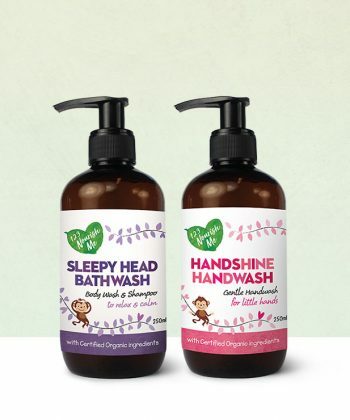 Introducing an all-natural, organic handwash designed to make big and little hands sparkle! Triclosan, synthetic fragrances, parabens, artificial colours, formaldehyde causing agents or animal derived ingredients. Confusing, isn’t it? There are times when ‘fragrance’ or ‘parfum’ on a label is OK and other times that it is not OK when it represents something synthetic and nasty! In our product ‘parfum’ is a vegetable based natural preservative and not a synthetic one. You cannot have an Australian Certified Organic Product and use synthetic ingredients. Our Handshine has passed the Australian Certified Organic Certification Process and is an Australian Certified Organic approved product.